Several of the books I’ve recently read deal with the traumatic impact on a child of the loss of their mother and the father’s cold, cruel behaviour, usually intensified by his replacing his wife with someone unsympathetic to that child. That’s the case in William Maxwell’s So Long, See You Tomorrow and Barbara Comyns’ The Vet’s Daughter. Even in Lolly Willowes by Sylvia Townsend Warner, the eponymous heroine’s story is precipitated by the death of her parents and her decision to leave the unloving, constraining sanctuary she’d temporarily found with her brother and his family. Patrick McGrath (born in London in 1950, long resident in Canada then the USA) deals in darker areas of the human psyche. It’s not surprising, therefore, that his eponymous first-person narrator, Dennis Cleg, bizarrely but appropriately nicknamed Spider, will react to his family drama in far more extreme, dangerous ways than the characters in the books I just mentioned. It’s a painful experience, reading this novel. 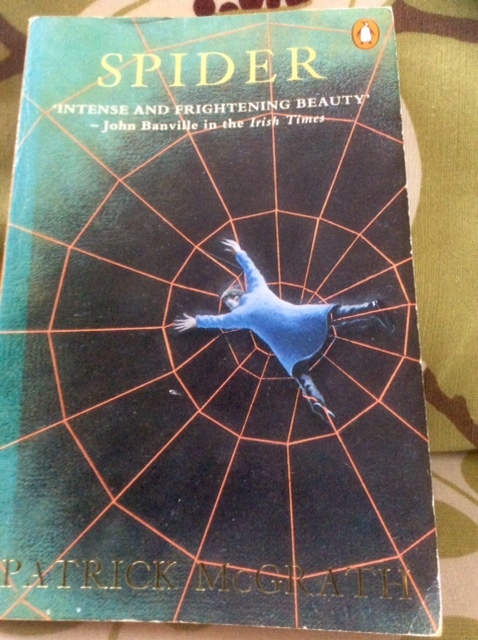 Spider slowly spins out his web of a story in sections of flashback – to the childhood when his father abused and tormented both his wife and young son, and to a present when it gradually becomes apparent that the grown-up Spider is living in some kind of halfway house after release from a mental institution. He has trouble with the time frames: past intrudes into the present, and it’s not always possible for the narrator to distinguish then from now, reality from fantasy. He hears voices and disturbing noises in the attic. He loves the ‘rain and mist and darkness’, the ‘wetness and darkness and skies like thick gray blankets’ of grimy London slum of his childhood. His voice often resorts to that list structure and repetition of such details to evoke an obsessive attention and reaction to his bleak, modern-gothic surroundings. The adult Spider spends his solitary days walking, sitting by a canal smoking roll-ups and trying to avoid looking at the gas-holders. He has a thing about gas, for reasons only revealed near the end. I found this troubling and unsettling to read, not always in a rewarding way. I know when he was a child McGrath’s father was medical superintendent at Broadmoor Hospital, treating criminally insane inmates, and that he himself worked in a Canadian top security unit in a mental health centre. He uses this first-hand experience to chilling effect in his writing. It’s never possible to rely on this narrative’s veracity; Spider’s story becomes increasingly incoherent and contradictory as his disintegrating mind circles around the objects caught in his web of memories and fantasies. There’s a murder, but he refuses to accept that he committed it, even though it results in his being institutionalised for decades. As a drastic coping mechanism he learns to split his identity or personality, one representing his ‘good’ side, the other that’s been ‘poisoned’ and gone ‘bad’. “It’s my fault – you go to sleep, it’s all right, I’m fine now.” And she leaned over to kiss me on the forehead, and I felt the dampness of her tears on her face. Oh, I hated him then! Then I would have killed him, were it in my power – he had a squalid nature, that man, he was dead inside, stinking and rotten and dead. McGrath excels at using language to reproduce the voice of a deranged, troubled person; here the fractured or disjointed syntax and pulsating rhythms and repetitions are deeply disturbed and disturbing. Spider struggles with extreme emotions or challenging events; then he becomes, as he puts it, ‘uncoupled’ – a term that’s richly suggestive. I can’t say then that I enjoyed this novel. Its deeply disturbed, damaged narrator’s voice is insidious, like a nightmare that you can’t wake from. Asylum (1996), which is the best of the three, in my opinion: again it deals with a psychologically disturbed man in…well, an asylum, and the wildly dangerous affair with him that the institution’s medical director’s wife enters into. Constance (2013) has a narrator less psychotic than these other two, but still emotionally and mentally unstable. David Cronenberg, himself not averse to exploring the disturbed psyche, filmed Spider in 2002. David Mackenzie directed Asylum in 2005. This entry was posted in Literature and tagged gothic horror, Patrick McGrath, Spider by Simon Lavery. Bookmark the permalink. I was wondering if it was the same “Spider” as the movie when I started reading your review. It was a disturbing movie. I don’t know if I could read the book, as well. I’m actually a big Cronenberg fan, and this was a smidge more mainstream than some of his other films, but still very, very dark. Ralph Fiennes was wonderfully creepy. More frightening than Voldemort! I’ve not seen the film yet, but liked most of what I’ve seen of Cronenberg’s work, so shall seek it out. It seems like the book is much more detailed (no surprise) than the movie, but it definitely has the same overarching mood. I recommend the movie. I’d like to see how the film deals with the unreliable narrator’s voice, The interiority of it. Well, I would say it was handled well. 🙂 Although I’m sure you meant how they handled technically it as opposed to “how well it was done” right? I was fooled by him. I knew he was shifty, but I wasn’t quite sure what was going on. And I really like to figure things out so it wasn’t as though I didn’t try! I suppose I meant both. Even in the novel there are uncertainties about what really (!) happened.